Peanuts: Where's the Blanket, Charlie Brown? Linus' blanket is missing and it's up to you and the Peanuts gang to track it down. Play the game in 3rd Person environment either as Charlie Brown or Lucy as Snoopy guides through educational puzzles and small mini games. 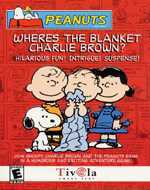 The game will take the player to different locations such as Exploring Charlie Brown's Home, Magic Show, Super Market, Library, Computer Camp, Garden and various other locations to explore and finds the missing Blanket. Also many different activities are bundled with the game for children like making their own drawings with Peanuts Gang and taking the printout with the attached printer for colouring etc.